A while back I was talking with my mother-in-law and she asked if I’d be willing to knit her another pair of socks. When it comes to people for whom I get to knit, she’s one of my favorites. As a knitter herself, she appreciates the time and effort put into each project. Really, when you’re knitting for someone that’s important. I let her know that I had a few things I had to clear through before I would get there, but that yes, indeed I’d be happy to knit some socks for her. We discussed fit and customizing them a bit for her as she lives in a warmer climate. I was hoping to get to them in early February, but alas, it was the last week of the month before I got there. I grabbed a skein of stash yarn that I thought was Shibui Sock (now discontinued), but honestly I don’t know what it is, and got knitting. 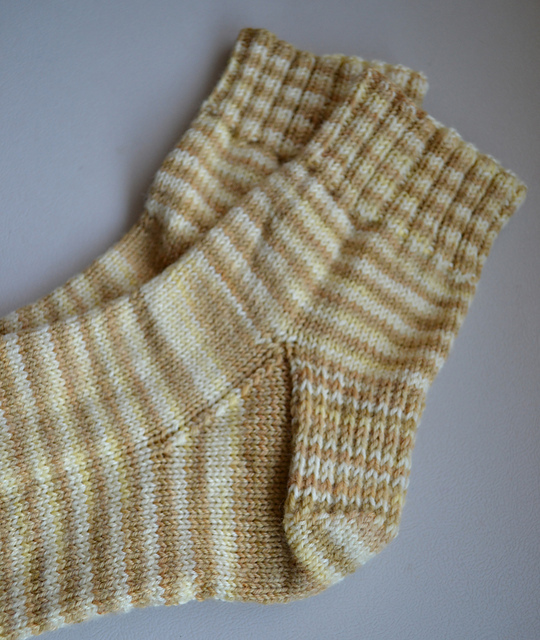 I used the Churchmouse Yarns and Teas Basic Sock pattern just because it’s such a good standard with which to start. I did try out my Sock Ruler for the first time on this pair. I saw Susan B. Anderson using one early last fall and as soon as they were in stock I ordered one to try it out. I’ll start by saying that I do really like it and I’ll definitely be using it regularly. I think it’s a great tool for anyone who knits a lot of socks. 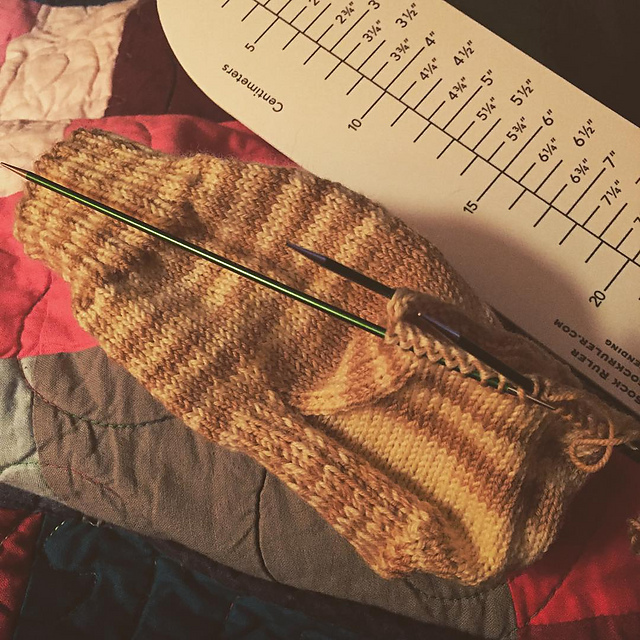 That said, for those of us who have knit a lot of socks and are used to measuring — you know — with a tape measure or small ruler, I found that the sock ruler definitely took a little getting used to. All new tools have a bit of a learning curve though. The only other downside of the ruler is that it’s a little big for my small project bags. All things considered, though, like I said I’ll be using this new tool a lot. It’s quick and easy to use and I think in the end it will help me to be a little more accurate with sock measurements. Of course, with the short cuff & leg, these socks were done in a jiffy and I popped them in the mail to my mother-in-law for a test fit last week. I think they turned out very cute. 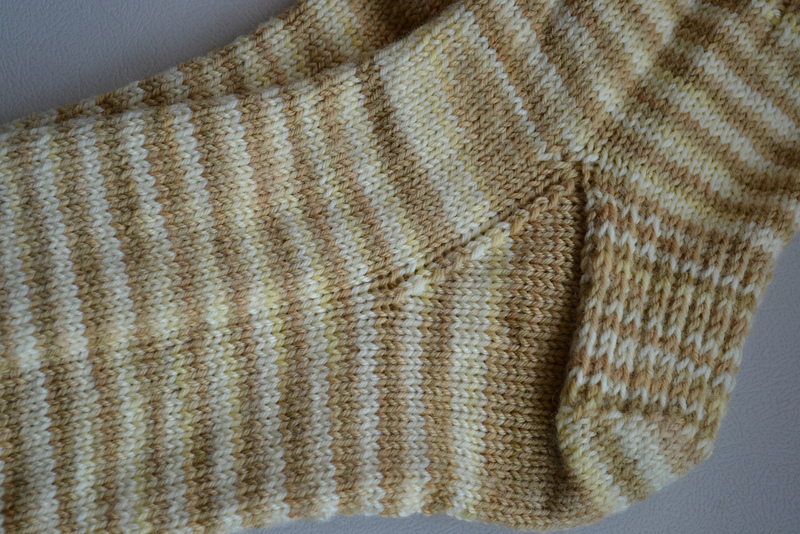 As you can see, I didn’t really bother with maintaining the striping when I was turning the heel. Seeing as though it’s a prototype for sizing, I was more interested in getting them done and shipped off for a fitting than messing about with being precious about the striping. I honestly think they look great — I probably wouldn’t have even paid any mind to the stripes interrupted if I hadn’t been talking striped socks with a knitting friend. I was happy to hear my mother-in-law loved them and the fit is great. Hooray! I’ve got more yarn lined up and it sounds like my mother-in-law wouldn’t mind a couple more pairs. Double hooray! I’m very happy to have checked this off my to-do list and especially that they were a success. 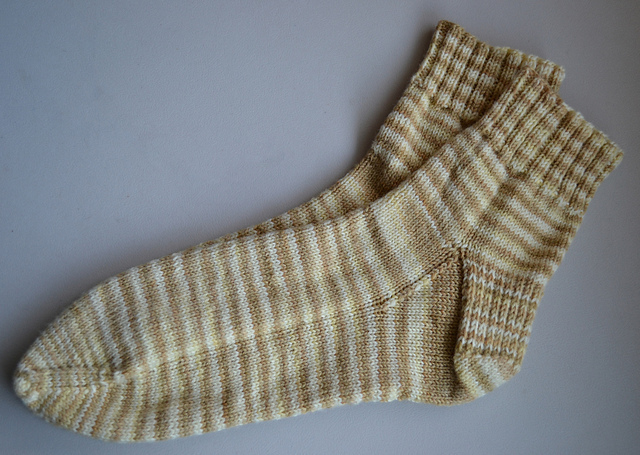 It was also just great to knit up a quick pair of socks as it’s been a while since I finished a pair. All the better that they were made for someone who I know will really love them. I kind of can’t wait to get another pair of socks on the needles now! Love these, and I’d have never noticed the stripes if you hadn’t pointed it out – and I’m usually pretty pissy about those things. 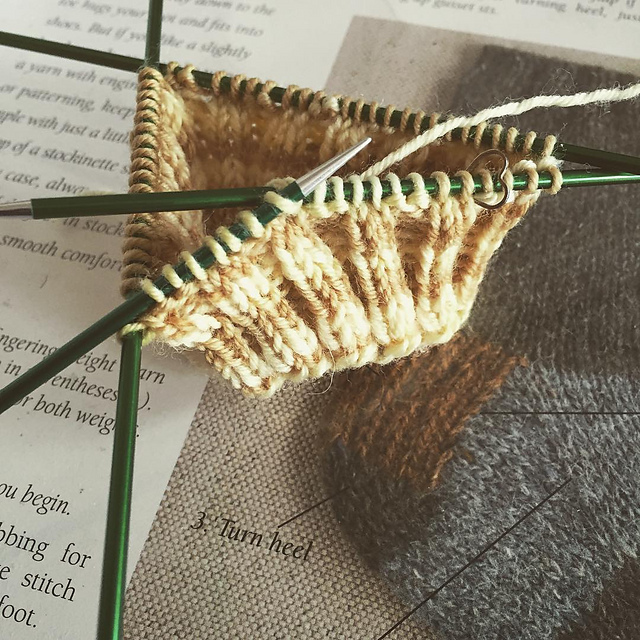 🙂 I’ve been itching to get another pair on my needles too – I’ve decided that no matter what other knitting projects I have going on, I should ALWAYS have socks on the needles! So true! I’ve been out of the habit of having socks going in favor of any random stockinette or easily memorized project. Definitely need to get back to it though! I love knitting for people who really appreciate the craft. Like my mom. I’m not 100% this one is Shibui Sock, but I do have a different pair that are that I’ve had a few years. I was a little worried the 100% merino wouldn’t hold up super well, but they are still in great shape. I would definitely knit them at a relatively tight gauge (at least 8sts per inch) to make for a stronger fabric, but otherwise they are just fine. Exactly! It’s going to be fun! Love the socks! I’m anxious to try my sock ruler; was there something specific that was challenging or just that it was different? No, nothing particularly challenging. Just getting used to it was the only challenge for me and it wasn’t bad at all. Having made a few dozen socks measuring one way I had it down to a science, so I t just took a bit for me to get a feel for it. These are lovely! It’s always nice to knit for someone who really appreciates them and understands how much love goes into it. Thank you! And yes! I totally agree! The socks are so cute! I haven’t done any socks in awhile; maybe this will inspire me to knit a new pair. Yes! I had the same reaction — they were so quick and fun. I’m definitely inspired to knit more socks soon, too!